Bridging minds is about being able to get out of your own thoughts, to recognize and respond to what is going on in your child’s head. It is being able to adapt your own behaviours based on what your child is thinking, doing and is showing interest in. When you are aware of your child’s cues, and communicate with and guide them based on their cues, you are actively engaging in bridging minds to stimulate your child’s brain. Your child’s brain capacity is a result of ‘nature’ (your child’s biological makeup) and ‘nurture’ (the environment you provide for your child) from birth and throughout their life. Your interactions with your child will help form new connections between all the different parts of their brain and build the emotional and cognitive skills your child needs in life. These interactions impact how your child’s early experiences, whether stressful or supportive, affect how their brain develops. They also account for how environmental factors on your child’s development varies taking into consideration underlying individual genetic characteristics. This means that early experiences and early learning environments critically shape all domains of your child’s development. All this talk has been about the child’s brain. But there are interesting scientific facts that can perhaps give us a better sense of what happens in our brain when we interact with and respond to our child and why we behave as such. When we become a mother, naturally, a lot of changes happen. One of these major ones is the emotional change due to neurological and hormonal changes in us. This means that our maternal feelings of overwhelming love, intense protectiveness, and constant worry begin with very strong reactions in the brain - as mothers, we become hypersensitive to our child’s needs – with one common goal which is, wanting the best for your child. As a result, we sometimes are not able to positively stimulate our children’s brains as we lose sight of what is or is not developmentally appropriate expectations. We may also believe that since the first 3 years are critical, that we should perhaps be cramming as much as we can to make sure that our child doesn’t miss out. STOP dear mum! Breathe and read on. First keep in mind that we as mums are in a hypersensitive state… pretty much most of the time. When we say the first 3 years are critical, this means that the emotional, affection and safety aspects are the absolute most crucial factors to having a healthy developing child. Make sure therefore that you provide your child with as much affection and emotional stimulation as possible. Ensure that they are in a safe positive stimulating environment for them to grow in. You’re a great mum and most likely doing that already. 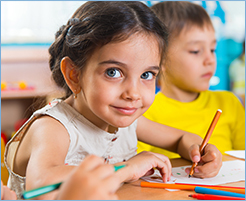 You have built strong foundations for your child to learn and be stimulated. TALK to your child and pay attention to what THEY say: Your child coos and babbles until they reach conventional forms of communication, e.g. learning the rules of a language, talking, asking questions and so forth. As a mum, avoid baby talk but make it affection filled – smile when they smile, ask a question or converse with them when they make a sound or say something - it stimulates their brain to build communication and social skills. Communicate in sentences: Babies and children also imitate sounds and actions around them; don’t talk to them with words in isolation – make it relevant to their context – talk and gesture/point to help them make certain associations between words and objects; ask, question, talk positively…show affect - these all also help with their focus and impulses. Engage your child with their own interests so that they can develop these to their maximum potential. Engage in face-to-face interactions: In today’s fast moving digital age, more tech-to-face interactions are happening rather than face to face human interactions. 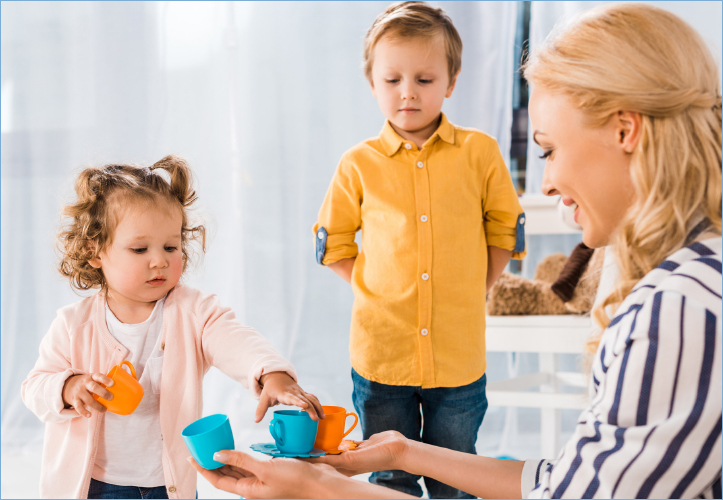 Human interactions continue to be the most crucial aspect to a child’s social, emotional, and language development – the path to their healthy cognitive development. We have often heard that we should go down to their eye-level, sit with them, engage in pretend play, and all the fun things our children have us do…well let’s face it – we are the best toy in the house. The idea isn’t to completely detach yourself from your electronic gadget, or the digital world or other preoccupations which we all seriously may have. But the fact remains that our children need ongoing interaction and input from us in order to be stimulated to learn. So the next time you go to the playground with your child, go to a restaurant, or simply play or relax together at home, set aside some tech-free time. Connect with your child. Focus more on having uninterrupted interactions, even if only for an hour of your day. Don’t allow for distractions to be the norm in your interactions. Dear hypersensitive mummy – we are all on that same boat. We simply want to do it all right for our children. But sometimes, our concern to have our children achieve our own expectations of their development is a result of our hypersensitive selves to have our child fit the norm. Remember, that norm is very limiting and neglects individual difference. So pace yourselves and your children - time is key, but more importantly, it is how you regulate your hypersensitive brain to positively stimulate your child’s learning. Recognize your child’s individual differences and respond actively to what they are engaged in as opposed to desperately, negatively, or passively. Respect and trust your child…it all happens in good time. Their childhood is ahead of them – when they are developmentally ready -with your active support and a healthy environment, the learning curve happens faster than we give them credit for.